After being only two points ahead heading into the final day, Mount Maunganui put on a stellar performance in the final day to win the Surf Life Saving New Zealand (SLSNZ) Championship by securing a total of 166 points. Coming in second place was Mairangi Bay Surf Life Saving Club, who ended the competition on 104 points. They also managed to place first and second in the iconic open mixed lifesaver relay event, which is described by lifeguards as a “massive” race and includes a (five person) surf boat, (rescue) board, swim, ski (similar in structure to a single person kayak or canoe) and sprint (run) legs involving a total of nine athletes. Finishing third was local team Waikanae Surf Life Saving Club, who finished on 94 points. They had several strong results in the surf canoe events which boosted their points ahead of the final day today. 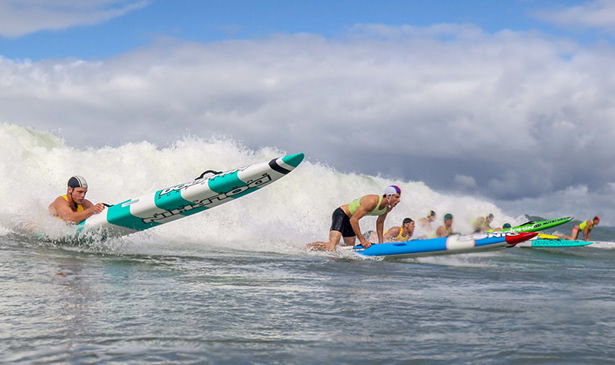 Omanu Surf Life Saving Club and Orewa Surf Life Saving Club finished on fourth and fifth respectively, finishing only five points apart after the three days of full on racing. Event hosts Midway SLSC finished in sixth while Titahi Bay SLSC finished as the top SLSNZ central region team in seventh. The top south island team was Waimari SLSC who finished in 14th. Over the course of the event, results are compiled to give an overall top male athlete, top female athlete and top team which have been awarded to: Daniel Shanahan from Mount Maunganui (three gold medals), Danielle McKenzie from Mairangi Bay (eight gold medals and one silver medal), and Mount Maunganui Under-19 Men’s Taplin Teams (Finished first, second and third in the Under-19 Taplin final). TSB New Zealand Surf Life Saving Championships event manager Scott Bicknell said the event was “a huge success” and the athletes were passionate and dedicated all weekend. “The TSB New Zealand Surf Life Saving Championships have been a huge success. We had a few challenges along the way with the weather but ultimately, the event ran smoothly. All the athletes really enjoyed themselves and Midway Beach has again proven it’s a great venue for an event like this. Mr Bicknell also said the passion for the sport really shone through this weekend amongst the athletes. “Even if you weren’t on the beach, you knew when there was a final taking place because the crowd would just go nuts cheering for their friends. It’s that passion that made it such an exciting event because they put everything on the line each day, and that’s reflected in some of the results like the lifesaver relay. The next major event on the SLSNZ calendar is the BP New Zealand IRB Championships, held at Waihi Beach on April 7-8. However, athletes from the SLSNZ High Performance squads will be travelling to Japan and Australia later this year to compete in global lifesaving events, with announcements coming soon.